I am trying to wait patiently for First Mate to arrive. I am finding this waiting business to be a bit difficult. So I am trying to find ways to occupy my time and get my mind off of this waiting game. What better way than to make homemade Christmas presents! To get some homemade inspiration, I checked out Pinterest. I am not an avid Pinterest user and really had no idea what I was doing. I did a simple “homemade Christmas present” search and came across homemade layered peppermint hot cocoa. Considering my love for peppermint hot cocoa, I thought making some was a great idea. I followed the recipe from this website, http://www.greensnchocolate.com/2011/12/homemade-peppermint-hot-cocoa-mix.html#LfDqdLleIrDcTk4S.03. I used one pint canning jars. The recipe in the above link is for making one quart of cocoa, so I divided the recipe in half in order to fill my one pint jars. I made six jars of peppermint hot cocoa. I am also not the craftiest person, so I was unsure how to decorate the jars. I followed the directions (for the most part) off of this website, http://www.maybematilda.com/2011/04/baby-shower-gift-homemade-sugar-scrub.html. The one thing that I did not do was decorate the lid. I initially tried to decorate the lid but I could not close the jar properly and it was all just a bit too complicated so I nixed that idea all together. I purchased the card stock for decorating at Michaels. I purchased clearance card stock for $.29 a piece. I purchased the canning jars at Target, 12 one pint canning jars for $8.97. I purchased the cocoa ingredients at Target and Publix. You may be able to find these items cheaper, but being 41 weeks pregnant and toting an almost three year old around, I cannot really bargain shop. When I was checking out the website maybematilda.com, along with the canning decorating instructions, there were instructions for making homemade sugar scrub. I was intrigued by this idea, so I decided to use the remaining six canning jars to make peppermint sugar scrub. I could not believe how easy it was to make sugar scrub. I will never buy any sugar scrub from the store again! The recipe calls for 3 cups of sugar, 1 cup plus 2 Tablespoons of olive oil, and drops of essential oil. I used peppermint oil for two reasons: one, to match the peppermint hot cocoa, and two, it is the only essential oil that I own! You simply mix the three ingredients and put it in the canning jar. This project literally took me 10 minutes to complete! Although the assembly of the cocoa and sugar scrub were pretty fast, what took the longest was decorating the jars. From washing and drying the jars, cutting the card stock, printing labels and instructions, gluing the labels to the jars and waiting for everything to dry, this project took me two days. Now not two days straight, probably two hours the first day and an hour the second day. I worked on this project while Capt’n in Training was sleeping and/or when he was watching The Lorax, his new favorite movie! Here is the finished project. I can’t wait to give them away as presents! They may be late Christmas presents if First Mate decides to enter the world soon! 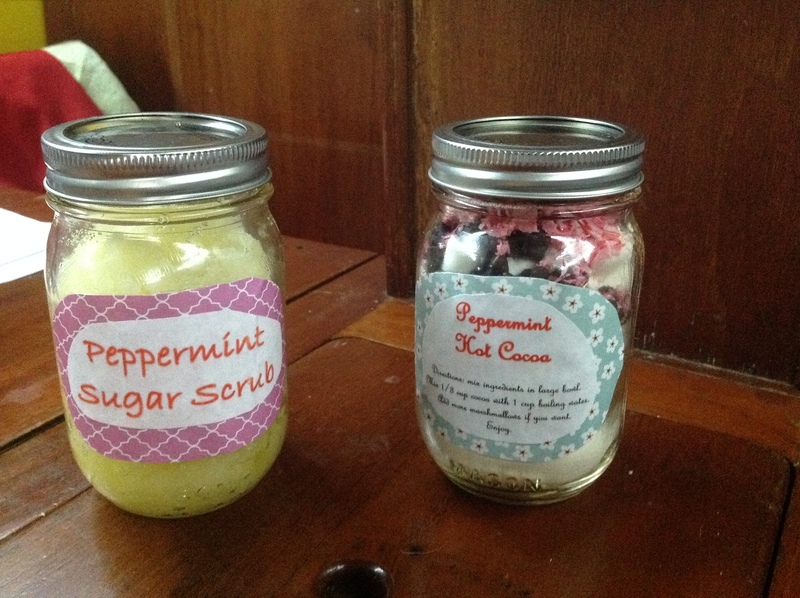 I made Peppermint Sugar Scrub and Peppermint Hot Cocoa to give as Christmas presents this year.